If you want a really laid back, sweet, and calm bunny...the Havana Rabbit is the one for you! This bunny is a real beauty with its soft, shiny and rich colored fur coat. The Havana Rabbit is a very nice a nice show rabbit, but they are also generally considered to make excellent pets. They are one of the most well-rounded rabbits with a sweet docile personality. Havana Rabbits are calm and very laid back. These sweet tempered bunnies will quickly bond with their owners. They enjoy receiving attention and affection. Being on the smaller side of the medium sized rabbits, the quiet Havana rabbits need a minimal amount of space and they don't eat as much as the larger rabbits. Background: Havana rabbits originated in Europe and were first bred in Holland in 1898. Though the actual original parentage is uncertain, it is known that they first showed up in the litter of a female Dutch Rabbit. Who the father was, however, is simply not known. They were introduce into the United States in 1916 and in Eastern Canada in the 1980's. Description: These guys are considered to be a medium breed rabbit and will weigh between 4.5 to 6.5 lbs. when full grown. They have a short, rounded body, fairly short upright ears and short soft dense fur that is easy to care for. 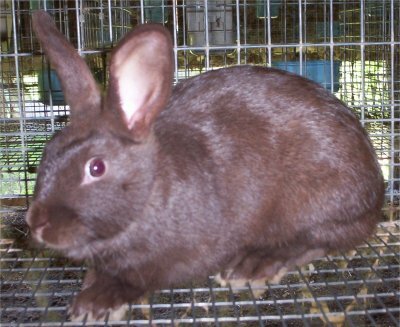 The Havana rabbits color is very dark and intense as compared to most other breeds. The colors are Chocolate, Black, and Blue. How long do havanas normally live for?